This image of the 30 Doradus Nebula, a rambunctious stellar nursery, and the enlarged inset photo show a heavyweight star that may have been kicked out of its home by a pair of heftier siblings. 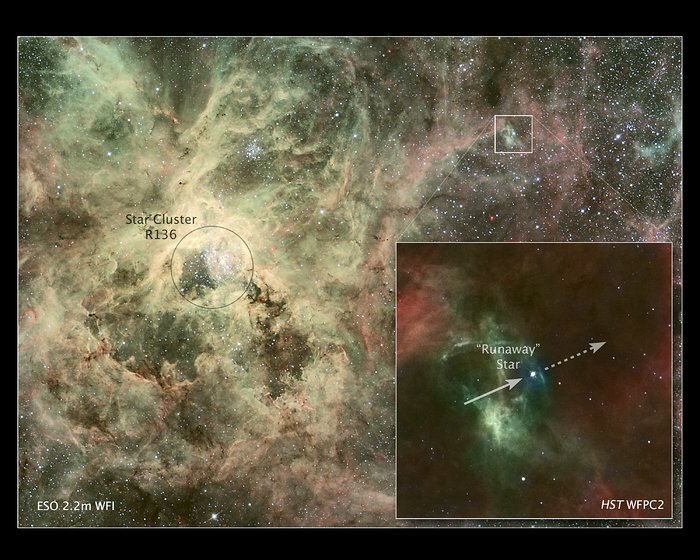 In the inset image at right, an arrow points to the stellar runaway and a dashed arrow to its presumed direction of motion. The image was taken by the Wide Field and Planetary Camera 2 (WFPC2) aboard the NASA/ESA Hubble Space Telescope. The heavyweight star, called 30 Dor #016, is 90 times more massive than the Sun and is travelling at more than 400 000 kilometres an hour from its home. In the wider view of 30 Doradus, the homeless star, located on the outskirts of the nebula, is centred within a white box. The box shows Hubble’s field of view. The image was taken by the European Southern Observatory’s (ESO) Wide Field Imager at the MPG/ESO 2.2-metre telescope on La Silla, Chile. The young star, only one million to two million years old, may have travelled about 375 light-years from its suspected home in R136, the bright star cluster marked by a circle. Nestled in the core of 30 Doradus, R136 is one of the most massive young star clusters in nearby galaxies, containing several stars topping 100 solar masses each. 30 Doradus, also called the Tarantula Nebula, resides roughly 170 000 light-years from Earth, in the Large Magellanic Cloud. Instruments at three observatories, including Hubble’s WFPC2 and recently installed Cosmic Origins Spectrograph, have provided tantalising clues that the star was ejected from R136. In the ESO and WFPC2 images, hot stars are represented by the colour blue. Hydrogen is in red and oxygen in green. Radiation from the runaway star is making the nebula glow. The Hubble image was taken on 30 June 1995; the ESO image was released in December 2006. Notes: The small image of 30 Dor #016 was captured by ESO ground-based telescopes, with added luminosity from Hubble's WFPC2.